Technology company, Continental has launched a new universal service tool for tyre pressure monitoring systems (TPMS). With the VDO TPMS Go device, workshops can not only program all common universal sensors for cars, but also read out nearly every TPMS sensor on the market. The TPMS Go combines the most important functions of the already-established VDO TPMS Pro device with a practical design, making it suitable as a supplement to a diagnostic device or as a slim and inexpensive first-choice device. “Our goal is to provide comprehensive support to workshops everywhere. That’s why we’re delighted to be able to offer more options for tyre service with the TPMS Go, regardless of whether the workshop wants to join the TPMS world or expand its TPMS options,” says Peter Wagner, Head of the Independent Aftermarket business segment at Continental. The TPMS Go can be used to display information such as the TPMS sensor ID, battery status, tyre air temperature and tyre pressure. “It’s a perfect choice for workshops that want to add TPMS to their range of services,” says Filip Kevilj, TPMS Tools Product Manager at Continental. Workshops that are already using a TPMS diagnostic tool like the TPMS Pro can also benefit from purchasing the TPMS Go. While the TPMS Pro has some additional options, like teaching sensors via the OBD II interface, the TPMS Go is particularly practical and is ideal as a second device, e.g. for a quick check during vehicle reception or if the larger TPMS tool is being used for another vehicle. 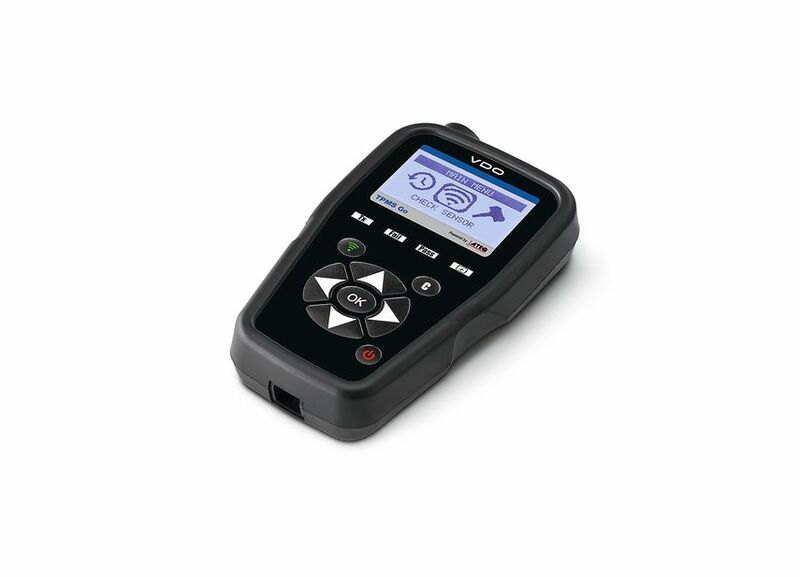 The VDO TPMS Go has an extensive, built-in database that provides a wealth of information about TPMS sensors, such as spare part numbers and torques. The database covers all OE sensors worldwide and also the most common universal sensors. Thanks to its compact, rugged design and simple, ergonomic, easy-to-understand user interface, the TPMS Go makes technicians’ work a lot easier, since it enables them to react more flexibly and quickly. One example of this is performing an easy, quick check on tyre pressure sensors while the car is still on the parking lot. Users can perform updates via the WebTPM PC software and offers a two-year license for updates to all common and programmable sensor brands.